Late April. A lot of trees still have tiny little suggestions of leaves, but all are leafed out, at least a little, save a South Carolina mimosa in my front yard. Last year about this time a tree man came by and tried to get me to pay him to cut it down. He assumed it was dead, but I knew better. The beautiful flowers we call “honeysuckles” are blooming. Wild azaleas they are: pale pink, pink, yellow, orange, and flaming red. Not many red ones any more, but plenty of orange. We had a swamp honeysuckle in the swamp at Quebec. I wonder if it is still blooming. It finally grew to be twice my height. The swamp honeysuckle is pale pink, sticky, and it has a wonderful fragrance. The others do not have a noticeable fragrance. The cucumber tree (Fraser magnolia) is blooming also. I mentioned previously the gorgeous yellow lady’s slipper I found. Wow! Pink ones we have, a few, and they are beautiful. But the yellow is the queen! But flowers would be nothing without birds. Birds are magical creatures, especially just before dusk, and at daylight. I simply love to hear them in the early mornings. I put on a sweater and go out to sit on the porch and listen. For about thirty minutes in the early morning, just as it is getting light they delight my senses with their songs. After that they seem to thin out. Maybe they go wherever birds go in the daytime. Early evening brings them back, but the evening concert is never as good at the morning’s. 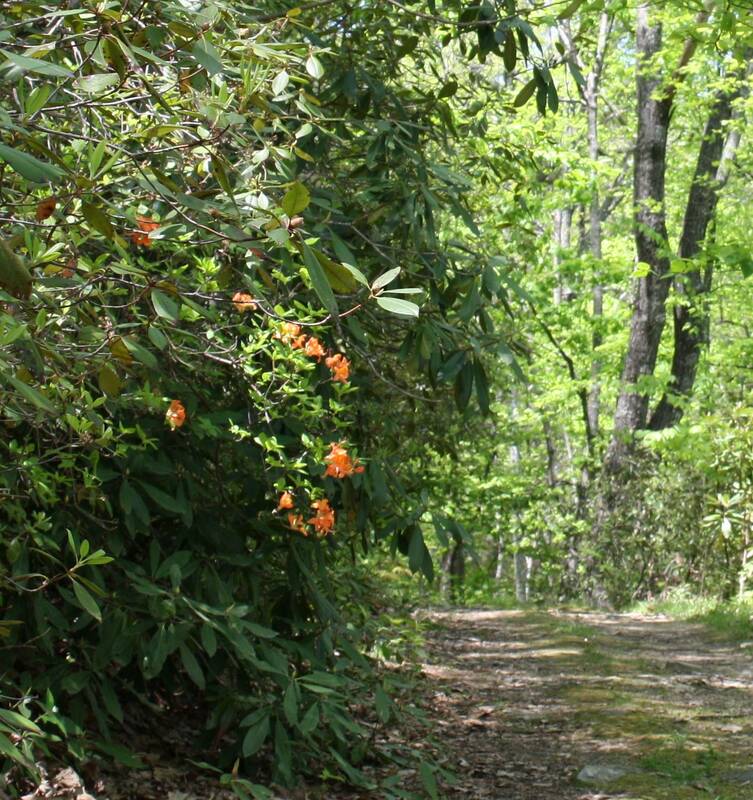 When I was a child we lived for a few years down below Brevard near the French Broad River. Our house looked over cornfields and pastures and sat in the edge of the woods. A small stream ran behind it. I will never forget summer mornings there. Two of my brothers and I would be up and out very early in the morning, exploring. It was my free time. There must have been hundreds of birds in the trees above us. They made such a din and a racket with their songs we could hardly hear each other speak. What a wonderful shining memory. What a wonderful place that was. Early this week I had a brush with a different sort of bird, a big bird, a wild turkey. We have some around here but they are pretty elusive. There are places in the woods where they scratch for bugs and worms. You can tell where they have been but you don’t see them very often. The photo here was taken up on the mountain above us with a remote game camera, the type that is motion activated. 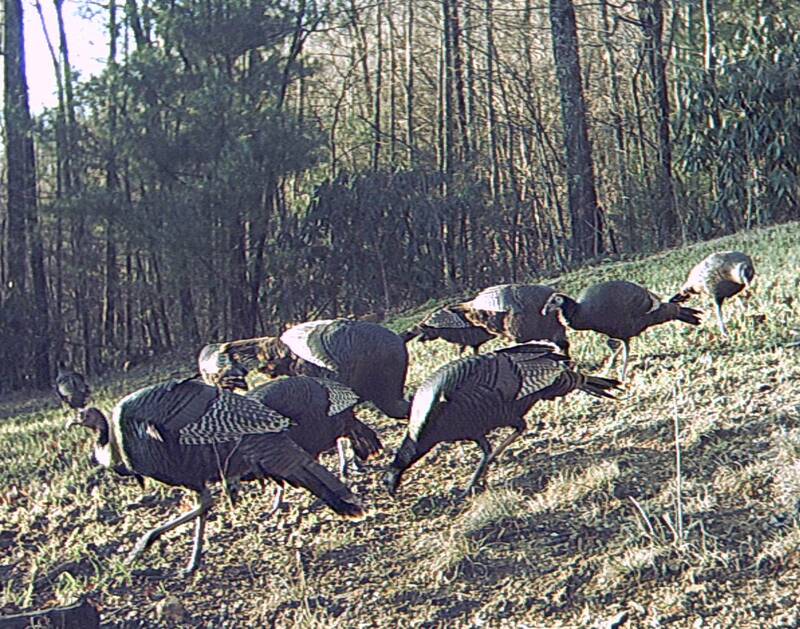 There are several turkeys in this group. I was on an old road a few days ago when I came close to two turkeys and scared them. Immediately they flew away. I had never seen a turkey fly before. We have two tame turkeys, but they only fly to the top of the fence post. I was amazed to see have gracefully, how swiftly, and how far a wild turkey can fly. One disappeared before I saw much of it. The other hesitated, but only a second. It got its bearings and rose high on its mighty wings, then sailed like a glider through the timbers. I never did see where it landed, but it surely was a looooong way off. Folks, a wild turkey can FLY! Last but not least: I was delighted this week to hear the “spring bird” again. They come the last of April; it is always a thrill to hear the first one call. These divine little creatures have the loveliest song I ever heard in the woods. For over twenty years I have been hoping to see one as he is singing his delightful chorus, in order to identify him. I have asked people repeatedly, “What bird is that?” or “Do you hear that bird? What is it?” A long time ago I was at Arthur Riddle’s house when one began to sing. I asked Arthur what bird it was. He said, “It’s the spring bird. 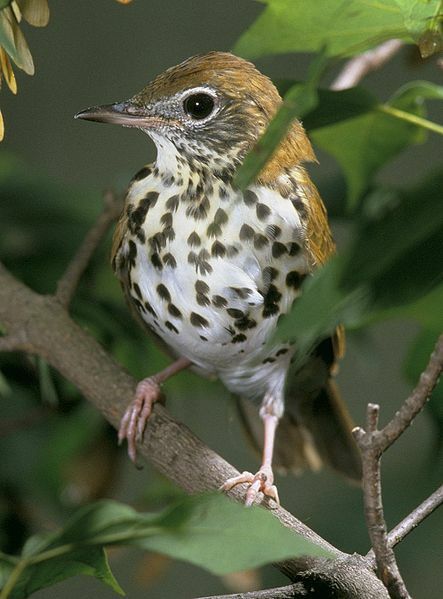 It comes in the spring.” Well, I found this evening, on the internet, it is the wood thrush. I am so delighted to put a name with a song. I read a little blurb that said Thoreau stated the wood thrush’s song was the most beautiful in nature, and I have to say that I agree. Here is a link to that beautiful music.